The 1974 Harley Davidson FLH Shovelhead for Sale has a classic 1974 STOCK 1200cc Shovelhead motor on a 1958 swing arm frame (FLH Electraglide) with 2004 special construction with 800 miles since the rebuild. the Harley is located in Silver Spring Maryland if you're in the area and would like to take a look. The 1974 Harley Shovelhead for sale has a perfectly dialed in kick start that kicks over easily and runs great. The vintage Harley Electraglide for sale is in great shape and if we make a deal, you can get on and ride it home! 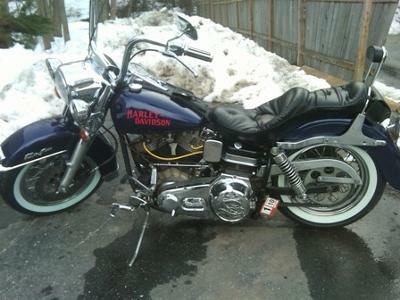 The Harley for sale is located in Silver Spring Maryland and you must See In Person to Really Appreciate It! I need to sell asap for financial reasons and my asking price is a negotiable $5,800. If you're interested you may get more info on the 1974 FLH by e-mailing me using the space below provided by GoGoCycles Used Motorcycles for Sale and I will get back with you as soon as possible. GoGoCycles would also encourage bikers to submit a review of the 1974 Harley Davidson FLH Shovelhead for Sale to help potential buyers make informed decisions and to benefit the biker community as a whole. I also live in Maryland and would like to see this bike. Please email me sniclefritz4@hotmail.com. I am in silverspring for the next couple days. I would like to find the scam artist in Singapore and kick him in the sleen until he vomits pure bile. I can export that to you....you maggot. I would like to buy this bike. Can this bike be exported to Singapore?